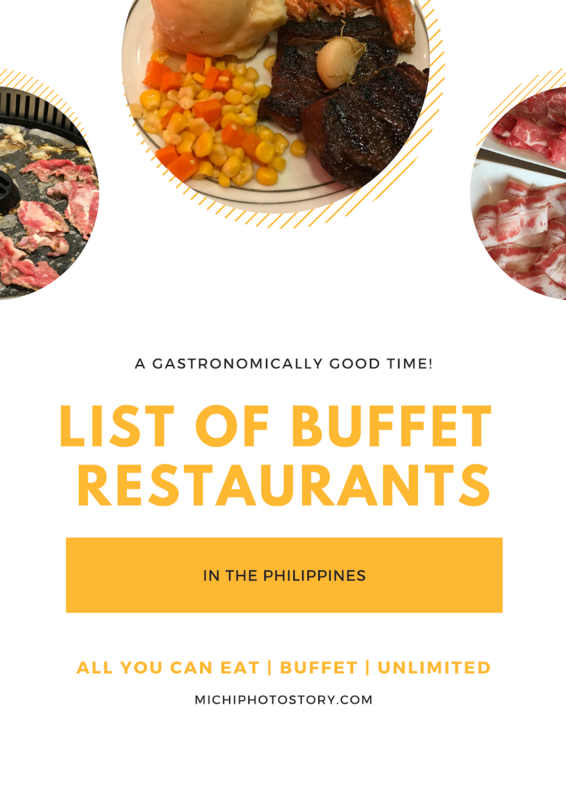 Filipinos love buffet so it is no longer surprising that we have a lot of All You Can Eat, Eat All You Can, Unlimited or Buffet restaurants in the country. Whether you are a big eater or small eater, I’m pretty sure that you will crave for an all-you-can-eat buffet. We are not big eater and we don’t have big appetite but from time to time we go to buffet restaurants to satisfy our craving, to celebrate special occasion, or to meet friends. Buffet rates are not cheap especially hotel buffets but there is nothing wrong if sometimes you treat yourself, have a feast or have a food adventure. My personal tip to save money is look for promos or discounts. There are online websites where you can buy buffet vouchers or coupons, some restaurants offer birthday, anniversary or even graduation promo, and some credit card companies offer discount, just use their card to pay for your food bill. If there is no promo, just look for affordable buffet restaurants, use your loyalty card or PWD ID/Senior Citizen ID. I was already in High School when I first experienced eating in an eat-all-you-can restaurant in Cebu. It was a very long time ago so I can’t remember the name of the restaurant. There are some restaurants that I have tried in the past but for now let me share the buffet restaurants that we have tried and I have blogged about. There are different types of buffet that you can choose from, it depends on your preference. There are buffets that serve ready cooked meals, buffets that have a chef who will cook the food for you and buffets that allow you to cook your own food. All You Can Eat restaurants normally serve hot and cold dishes, there are an appetizer, salad, main dish, and dessert. Whenever we go to Pangasinan, we used to pass Retiro Street so we discovered Redragon Buffet & Quickmeal. This is the cheapest buffet that we have tried, though I’m not sure if this restaurant still exists since hindi na kasi kami nadadaan sa Retiro. Aside from Cabalen, Dads, Saisaki and Kamayan is one of the popular buffet restaurants in the Philippines bago pa nagsulputan ang iba. Rates depend on the buffet that you will choose, most of the time we only choose Kamayan but when my sister-in-law celebrated his 30th birthday, nakapagCrossover kami. This restaurant opened sometime in 2014. If you love Filipino foods or if you have balikbayan or foreigner friends, then visit this restaurant. Aside from food, may cultural shows ka pa na mapapanood. When we learned that there is Vikings na sa SM BF, we immediately tried it. My friend celebrated her birthday here so I suggested to my husband, na dito na rin siya magbirthday so we can avail na FREE Birthday Buffet. This restaurant offers unlimited steak and shrimp so if you are a meat lover, you will definitely enjoy this restaurant. I haven’t tried this restaurant because this is located in Cebu but my husband always eat here if he has a business trip in Cebu. If you love seafood, you will have a happy tummy here. The Alley is different from other buffet restaurants because it offers 15 street-inspired food stalls that offer unlimited foods and drinks. You have to order the food and drink from each stall. There are Filipino, Italian, Japanese, Chinese and other international cuisines. Cabalen is one of the oldest buffet restaurants in the Philippines. They serve Filipino Cuisines and the majority of the dishes are Kapampangan dishes. They may have limited buffet spread but it is not that expensive. Budget is not over P400 if you will just avail the meal without bottomless drinks. For a different experience, try buffet restaurants that allow you to grill your own food. I’ve only tried Yakimix in ATC, it was a treat of my friend and it was the last time that we have tried it. I find the rate expensive kasi pero konti lang naman choices, though I'm not sure kung may improvement na. Su Won Garden is the new restaurant in Southwoods, Binan so if you love Korean food, then visit this restaurant. They offer unlimited pork, beef and chicken. Siram Gyupsal is an unlimited Korean BBQ house in Binan. They have two branches, one in Paseo San Antonio and the other branch is in Seaoil Tubigan. They offer unlimited pork, beef and chicken. If you don’t like to grill, then try a healthy version of buffet, shabu shabu or hotpot. I celebrated my birthday at King One Rotary Hotpot, it was my first shabu shabu experience. Dinayo din naman ito sa Hobbies of Asia. Four Season Buffet & Hotpot City is my most visited shabu shabu restaurant naman. I celebrated my birthday at MOA branch, then yung mga next visits na naman ay sa Southmall. If you love both grilling and hotpot, then visit the following restaurant so you can enjoy both. A Korean restaurant that offers unlimited beef, pork, chicken, shrimp and side dishes. Care to share your favorite buffet restaurant in the Philippines.